We’re planting a spring garden here at ikolam. And, we would like to involve all of our members in this activity. As you can see, kitty has prepared the garden bed already, and would very much appreciate some help from our generous member friends. Please give her a hand in adding some color to this garden, which is for one and all. Notice there are some colorless butterflies fluttering around in anticipation. What do you think they are looking for? I think we all know what the only goal of an adult butterfly in life is. They could make use of some bright colors and pretty wing patterns to select their mates. I’ve heard about an old American Indian Legend about butterflies; "To have a wish come true you must capture a butterfly. Whisper to the butterfly what your wish is, and then set it free. This little messenger will take your wish to the Great Spirit and it will come true." Feel free to create flower or butterfly rangolis of your choice. Please use the flower name as the title of your file when you upload. They could belong to any genus. Some of the common flowers are Roses, Sunflower, Geraniums, Dahlias, Snapdragons, Petunias, Aster, Lily, Lotus etc. This is one time where it is okay to get Impatient(s)! Check out the overflow flower patch which could not be accommodated in this garden. Truly awesome idea Lata mam, all ur creative ideas make this site more popular among kolam lovers! touchwood i always feel very happy to be a member of this site! That's very creative. As deepa said i always feel proud to be a memeber of this site. Great job lata. Well done Lata.. An awesum idea.. I hope by now all the members are ready with their favourite flowers!! let me try my level best to give out the best flower rangoli...Thank you very much lata for making our life interesting!! Hats off to u!! Thank you very much lata for making me cheerful. It is a great idea.Now it is a time to send flower or butterfly to upload in i-kolam site. Glad to know you liked it ladies. Rani, would two weeks be enough for you? We would also gladly accept after two weeks too. I got it Vidhya! Thanks for adopting a butterfly. Any restrictions Lata - I mean does it have to be a real kolam or can it be a virtual kolam also?? Thanx for the confirmation lata.. Wish to upload one tomorrow too...May I? Judy, no restrictions, any style in any medium is ok. ikolam considers all artwork as REAL, only the medium is different. Whether we make use of rangoli powder or a software program, we use our hands, imagination, effort, and time, in order to make them look nice . Restrictions are only for contests, and they are rules in order to achieve uniformity, to a greater extent. And, please don't hurry, we know you are busy helping kids projects. Make it only after you are completely done. Vidhya, more than one would be great. Double the joy, double the fragrance and double delight! oh! how i missed to see this. let me think and decide. wow nice.My flower will be here before I fly. Good to know, let me know when you decide which flower. If you don't see a particular category here, I would like to create a separate patch and add your name-label to it. A great idea and we are very happy to be a member in ikolam. I send a butterfly rangoli which was drawn at markazhi but suitable for this. Yes I see your rangoli Madhu madam. No wonder some of our butterflies got excited and started to flutter. we can send both butterfly and flowers in the same kolam right? Yes, it could be either way; a kolam with butterflies and flowers, or two separate kolams, or just send one containing one of either two elements. Whatever way is convenient for you Padmashree. can we upload more than two also, please let me know i will try my level best, is it a normal procedure to upload. Yes Sudha, you could if you wanted to. 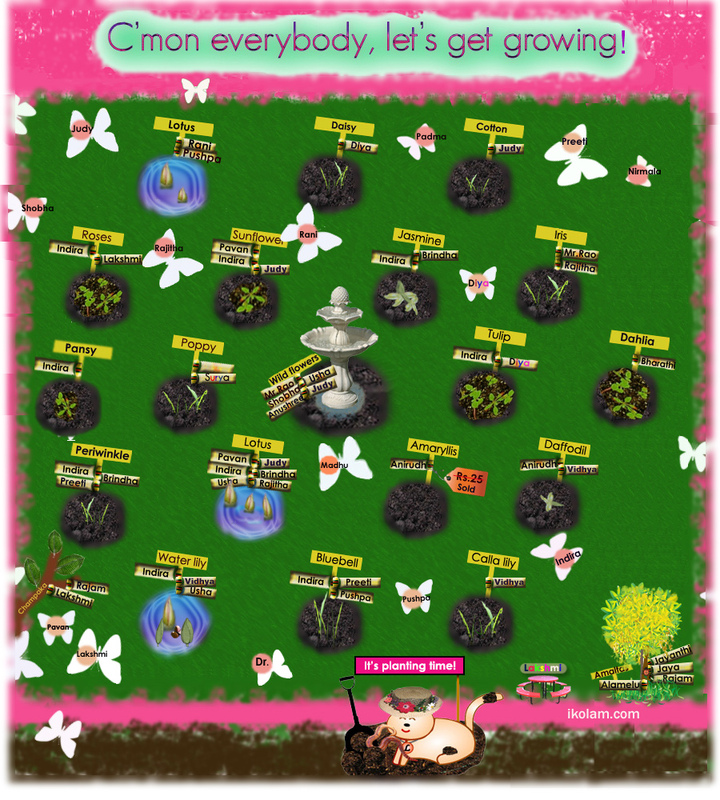 It is like a real garden, each member could plant whatever flower they are interested in. If you don't see a particular flower name in the patch, I'll create it based on the rangoli label (title) that you use when you upload in the queue. For example, if you are interested in Cactus flowers, go ahead and upload. You'll find a patch for Cactus flowers in a day or two, in the garden. Jasmine is available for me ? Nice to know your entire hand is green, not just your thumb. Usha, please let me know if your lotus kolam was meant for our members' garden, or is it a regular one. I need to add your name-label to the patch if it was meant for this page. Vidhya, your sense of humor is way high. hi vidhya..hehe superb comment!!! "kalyana samayal sadam ready...... ready ......vangu vangu.....ungaluku dhaan first!!! Lata, i had uploaded a pulli kolam with butterflies and flowers. Did u gei it? when i uploaded i couldn't c it. So please let me know . Padmashree, I got your kolam. Thank you. Lata, why not an 'amaltas' (கொன்றை) for myself, Rajamma and Jayanthi representing Tamil newyear/Vishu? Ya, why not? Does it look ok? I did it in a hurry. How much more time is there Lata?? I have so many and wonder if I can manage to upload any more?? lata it is for our garden only. tomorrow i will send vetable for garden, shall i send some more? Vinci, the garden belongs to all of us, and anybody could visit anytime. In other words, yes the garden will be open year round, and you could add to it when you could. No takers for Periwinkle?? I am taking it ! Uh...I think so Rani. I do remember seeing it, or did I? I don't know what happened to it. You might as well forget about it if you made it "good looking". ( a few of our members have uploaded "unnamed" flowers that might be going in the wild-flowers category. Anyway, the garden demands to get bigger. I am sort of waiting for our "Iris" to start sprouting. If you come across it roaming around, please send it back to the queue, for a "moderated" release. Lata, why does the Amaryllis cost Rs.25? Anything special for that? So how come Amaryllis wasn't picked up by anybody, earlier? Any thoughts, anyone? We would like you to guess, please. Consider it a game. If you really think about it, isn't the whole idea of the garden...things in it, like a game? Would the Amaryllis and the daffodil be ready by Sunday, by any chance? I hope they are, otherwise the other members are going to start complaining. (Members, please let me know if I've left out anyone's name in the labels you see). My iris plant has not to be seen, is it missing in the queue? Rajitha: I got your Iris. It is there in the queue. I will take care of it. Members, the last open slot - amaryllis had been taken yesterday. We finished making the corresponding preliminary templates this morning. As soon as we receive couple of already committed rangolis, we will publish them all together on Sunday. Lata, we will wait. பூ பூக்கும் ஓசை, அதை கேட்கத்தான் ஆசை ! பூ விரியும் காட்சி அதை பார்க்கத்தான் ஆசை !! The following message is for a few people who might get the impression that this is a ladies only site. This is a family site. And this site doesn't tolerate people who don't have good control over their choice of words. Mani, please keep a bottle of weed killer handy. I have a feeling we might need to kill more (weeds). Ok Daffodils and Amaryllis done, but I still have a few more flowers with me - wonder if I would be able to upload it soon :? when is the opening ceremony of the garden? cant wait lata.. Rani not only chase but will catch u soon.. (Unga aathukarar peru selvaraj ah hehe) Rajamma ji epdi irukinga? I wanted to call you but every time its getting postponed becoz of some silly reasons Def will make it on sunday.. Push (Dibbu) how r u? Lakshmi's dining table got changed to other side :D..
Lata.. i really dont understand last 2 lines..
lovely and lively. I think I am the pink and blue butterfly! Lata, this is beautifully designed.. hats off to u..
Lata,let my butterfly has red and yellow with black small rounds,in my childhood i first admired with the red colour butterfly.Hope our garden be colourful at very soon.Eagar to see. We are not able to view the The Veggie patch & Let's get growing kolams, how to do so.